Oakbrook, Ill. - April 30, 2003 - The Bratz Pack® and HeMan® and the Masters of the Universe® will be delighting children and collectors of all ages in the May McDonald's Happy Meal. Beginning Friday, May 2, through Thursday, May 29, young McDonald's guests will receive one of eight fashion-forward Bratz collectibles by MGA Entertainment® or one of eight action-packed He-Man and the Masters of the Universe figures by Mattel, Inc. in McDonald's Happy Meals. "McDonald's is always looking for hot toys that kids love to feature in our Happy Meals," said Karlin Linhardt, Senior Director of Kids and Family Marketing, McDonald's USA. "The combination of Bratz and He-Man and the Masters of the Universe gives kids a special offer with real sizzle. Featuring bold fashions on the Bratz collectibles and movable parts on The Masters of the Universe characters, this latest Happy Meal event creates hours of action-packed and accessorizing fun for our young guests." 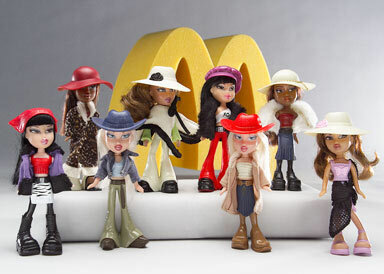 Winners of an unprecedented two consecutive People's Choice Toy of The Year awards, collectible Happy Meal versions of the original Bratz Pack® members will sashay their way into the hearts of young girls visiting McDonald's. Dressed in cutting-edge cool fashions for a day at the mall and funky fashion fever ensembles for a night out with friends, Yasmin, Cloe, Sasha and Jade collectibles will each feature two fashion forward outfits for a total of eight different trend-setting Happy Meal experiences. See a size comparison with the regular Bratz dolls. By the power of Grayskull, He-Man and The Masters of the Universe are back saving Eternia™ at neighborhood McDonald's restaurants. Redesigned with updated looks, He-Man and the Masters of the Universe continue on their never-ending mission to save the world from the evil forces of Skeletor®. 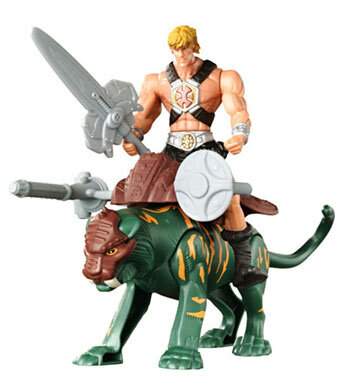 Each of the eight Masters of the Universe figures including He-Man, Skeletor, Battle Cat®, Man-At-Arms®, Beast Man®, Panthor®, Orko™ and Ram Man™, feature movable parts and battle weapons showcasing their unique personalities and battle skills. Attracting the imagination of an entirely new generation of young children, these characters also ignite the nostalgia of moms and dads who grew up with the tales of Eternia. "Everything old is new again, and retro toys like He-Man and the Masters of the Universe characters are a hot toy trend," said Geoff Walker, senior director of marketing for action figures, Mattel. "The tale of good versus evil is timeless. This Happy Meal experience will allow another generation of families and collectors to explore the imaginative world of He-Man and the Masters of the Universe." See a size comparison with the regular Masters of the Universe toys. The joint Bratz - He-Man and The Masters of the Universe McDonald's Happy Meal promotion will run May 2, 2003 - May 29, 2003 at participating McDonald's restaurants nationwide, while supplies last. The Happy Meal promotion will be supported by national television advertising developed by Leo Burnett Co. and Hispanic television by dRM DDB. McDonald's is the leading global foodservice retailer with more than 29,000 restaurants serving nearly 46 million people in 119 countries each day. Approximately 80 percent of McDonald's restaurants worldwide are owned and operated by independent, local businessmen and women. Mattel, Inc., (www.mattel.com) is the worldwide leader in the design, manufacture and marketing of toys and family products, including Barbie®, the most popular fashion doll ever created. Leading the toy and game market, the Mattel family is comprised of such best-selling brands as Hot Wheels®, Matchbox®, American Girl®, Tyco® R/C and Scrabble™, as well as Fisher-Price brands (www.fisher-price.com), including Little People®, Rescue Heroes™, Power Wheels® and a wide array of entertainment-inspired toy lines. With worldwide headquarters in El Segundo, Calif., Mattel employs more than 27,000 people in 36 countries and sells products in more than 150 nations throughout the world. The Mattel vision is to be the world's premier toy brands --- today and tomorrow. MASTERS OF THE UNIVERSE and associated trademarks are trademarks of Mattel, Inc. ©2003 Mattel, Inc. All Rights Reserved. BRATZ and associated trademarks are trademarks of MGA Entertainment, Inc. ©2003 MGA Entertainment, Inc. All Rights Reserved.